The March Board of Trustees meeting focused on the Carolina Center for Public Service and the new campus master plan. 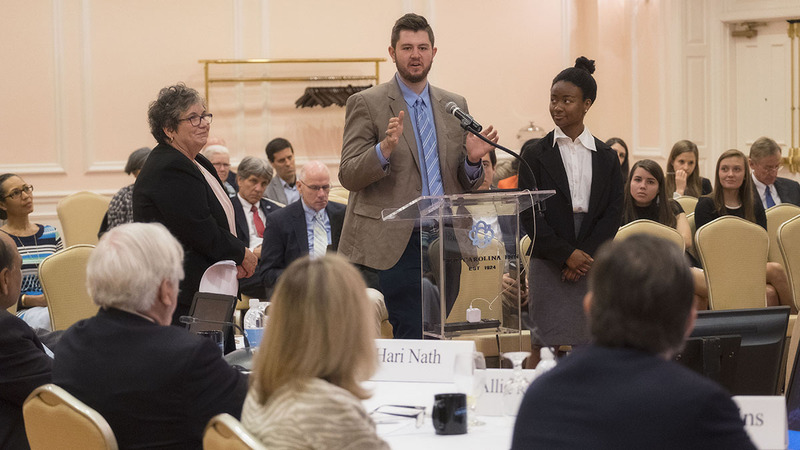 There is much more to the new campus master plan than bricks and mortar, and more sides to the Carolina Center for Public Service than merely doing good deeds. At their March meeting on Thursday, the University Board of Trustees got a primer on both from Anna Wu, associate vice chancellor for facilities and University architect, and Lynn Blanchard, director of the public service center. Both Wu and Blanchard also tied their work to the broader mission of Carolina and The Blueprint for Next, the strategic framework for Carolina. Wu focused her talk on the process she and her office have engaged in over the past year to “knit together” the master plan with The Blueprint for Next. What made the process unique, Wu said, was how the people working on the master plan joined with a campus-wide strategic liaison group to align the campus master plan with The Blueprint for Next. Because of these efforts, Wu added, the master plan that will be presented in May will not be a wholesale building program, but a document that identifies target opportunities to add facilities and spaces to advance the blueprint’s signature initiatives. “Together, we had a chance to identify the intersections of their objectives and explore how programmatic synergies, new transportation resources and physical assets could be leveraged for innovative and effective uses,” Wu said. For her part, Blanchard emphasized that the work being done at the Carolina Center for Public Service goes beyond simple volunteerism or what is typically thought of as community service. “We like to use the term ‘engaged’ because it means that this is not something we do to people, or even for people, but rather with people and communities,” she said. Chancellor Carol L. Folt said when she came to campus five years ago she heard students talking about APPLES. She didn’t know what it was then, but she does now. Of all the activities students can get involved with on this campus, the APPLES Service-Learning is one of the most profound because it transforms not only the communities that students work with but the students themselves, Folt said. Founded in 1990, APPLES has continued to strengthen civic engagement by bringing together students, faculty and communities in sustained and mutually beneficial partnerships, said Blanchard. APPLES, which is now operated by the public service center, offers alternative breaks, a service-learning initiative, internships, courses and fellowships. Another student initiative that has grown over the years is the Buckley Public Service Scholar program that launched in 2003, Blanchard said. In the 2016 academic year, the program engaged 1,557 participants who together logged 197,736 hours in 88 counties in North Carolina.